Our boat and bike tours in Provence feature the boat L’Estello. Our accommodation on the 2o passenger capacity boat is based on an outside-facing 2 bed cabin with private facilities and air-conditioning. We are pleased to discuss details on request. The other vessel operating on our Provence bike and boat holidays is 22 passenger capacity boat Caprice. Technical details: Length 39 m, width 5.2 m, depth 1.6 m, max. 20 passengers. Your accommodation: This is in an outside-facing two berth cabin. 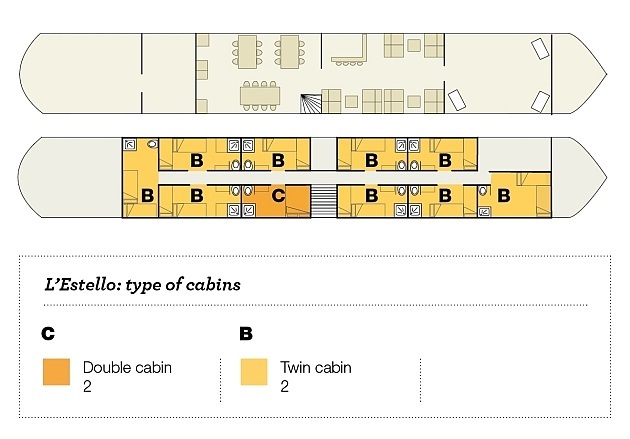 L’ESTELLO has 10 x 2 berth cabins (7-8 m2 ; 9 x twin /1 x double). Bed sizes: 1.90 / 2.00 m x 0.75/0.80 m .
Cabin facilities include: en-suite facilities including shower area and WC, wardrobe space, power socket, full-length mirror, air-conditioning and 2 fixed portholes, including one in the bathroom. On board facilities: The living area is air-conditioned and is divided into a restaurant with large picture windows and an open bar / lounge area with sofas and armchairs. There is a sundeck with tables / chairs and a fixed awning. Free wifi is usually available in the restaurant/ lounge bar area. Travel books, board games and pétanque/boules sets are available for your enjoyment. Important remarks regarding routing/program: Due to navigation conditions, the exact details of itineraries / embarkation points may be modified at the discretion of the Boat’s Captain. Some sailing during breakfast and /or the evening meal make take place to ease exit from town moorings or to shorten river cruise stretches.